Most (DCPSP)support services, including cancer education, KidsCan!, support groups, individual and family therapy, Pets At Duke and others are offered at no cost to patients and their loved ones. Pastoral Services Offering clinical chaplains on-site seven days a week, 24 hours a day. Clinical chaplains are members of the multi-disciplinary healthcare team, and are available to help patients and their loved ones cope with the psycho-spiritual and cultural-ethical concerns that may impact one’s beliefs, values, and emotions when facing a diagnosis and treatment of cancer. Guided Meditation Guided meditation promotes spiritual health and stress management and explores development of inner peace. Classes are held in the Duke Cancer Center Quiet Room, Level 0, on Mondays from 12:30 to 1 p.m. For more information or to schedule family sessions, call 919.684.3586.
treatment and hospitalization. Recreation therapy treatment interventions are facilitated in one to one and in group settings and are aimed at maintaining and/or improving functioning and well-being in the physical, social, emotional and cognitive domains. General recreational activities and resources are also offered. For more information, call 919.681.2928 or email at cancersupport@duke.edu. Pets at Duke Pets at Duke, a service made possible through the Duke Cancer Patient Support Program, offers many benefits. Research shows that pet therapy is an effective form of psychotherapy intervention, which reduces stress and depression. Pet therapy also provides a sense of companionship that can combat feelings of isolation. The relaxation and feelings of connection with an animal facilitate healing and rehabilitation. Visits are offered at cancer centers in Durham and Raleigh. To request a visit, call 919.681.2928 or email at cancersupport@duke.edu. Teen and Young Adult Oncology Program Our program provides teen and young adult (ages 15 to 29) patients and their families with support and community during diagnosis, treatment and survivorship. We offer specialized medical care, counseling support, peer connection and activity-based groups, both in the medical center and in the community, To learn more, call 919.684.4497. Concierge The Duke Cancer Center Concierge are available to give you guidance on where to stay, where to eat, entertainment, sporting events and more. We’ve also partnered with several local hotels to give you and your family concierge rates. To learn more, call 919.681.4947. Patient Navigators Navigators are available before, during and after treatment—making sure you have access to the support you need. Support is available for financial issues, travelling to the center, long-term housing and much more. For more information, call 919.613.6462. 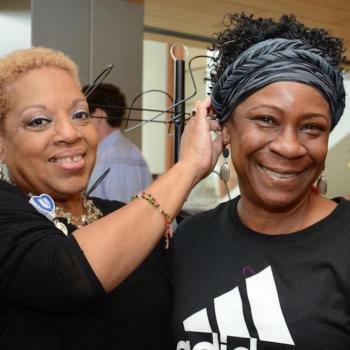 Salon services, available at no cost to patients, are made possible through the Duke Cancer Patient Support Program. Cancer Boutiques Self-image resources are available to help patients adapt to the changes they experience throughout treatment for cancer. The Belk Boutique at Duke Cancer Center Durham and at Duke Cancer Center Raleigh offer the latest trends in wigs, hats, caps, scarves, self-image products, post-surgical garments and prosthetics. Private consultation rooms are available. The boutique is open Monday through Friday, from 9 a.m. to 4 p.m. For more information, call 919.613.1906. Make-up and Skin Care If your cancer treatments have affected your skin or facial hair, then our volunteer cosmotologists are available to support you and your needs. Makeup and skincare consultations are offered as a complimentary service. Consultations are available at boutiques at Duke Cancer Center Durham and Duke Cancer Center Raleigh. For more information or to make an appointment, please call all 919.684.4497. Salon Services Why not have a personal consultation with one of our expert stylists? They can help you with wig care, styling and cutting and shaves. Our stylists are skilled in working with people who are experiencing hair loss because of treatment, and will be sensitive to your needs and concerns. Private consultations are available at Duke Cancer Center boutiques in Raleigh and Durham. To make an appointment, please call 919.684.4497. Duke Cancer Center offers spaces where our patients and their loved ones can relax and/or learn. These spaces are made possible through the Duke Cancer Patient Support Program. Quiet RoomThe Quiet Room is a tranquil space located in the Duke Cancer Center Level 0. You and your family can take time to reflect, relax, meditate or pray. The Quiet Room inspires peace, quiet and spiritual meditation in people of all faiths. The Quiet Room is open Monday through Friday from 6 a.m. until 8 p.m. Patient Resource Center The Patient Resource center, located on Level 0 of Duke Cancer Center, is home to hundreds of books, CDs, DVDs, booklets and magazines and is open from 8 a.m. to 4 p.m. For more information, call 919.684.6955. Garden of Tranquility The beautiful Seese-Thornton Garden of Tranquility offers you and your family an outdoor space for meditative thought and reflection. The garden is conveniently located in front of the Duke Cancer center. Seating is available. Treat yourself to a few moments of relaxation and serenity. Located off the Oncology Treatment Center Waiting Room (Level 4) at our cancer center in Durham, the Bernstein Family Garden offers an oasis of beauty. The rooftop garden features comfortable seating, providing a quiet place to sit, reflect and refresh. We invite you to return often to enjoy the seasonal plantings and a variety of events offered throughout the year. The garden is open Monday through Friday, from dawn to dusk.